The University is currently evaluating flexible spaces for teaching and learning. This is an investigation into the use of space layout, furniture and technology and how they should align with teaching practices across the institution. The result will inform recommendations for learning spaces in future building developments. Portland Square has two showcase rooms available with the latest Microsoft Surface Hub technology and furniture designed for adapting the space dependent on need. 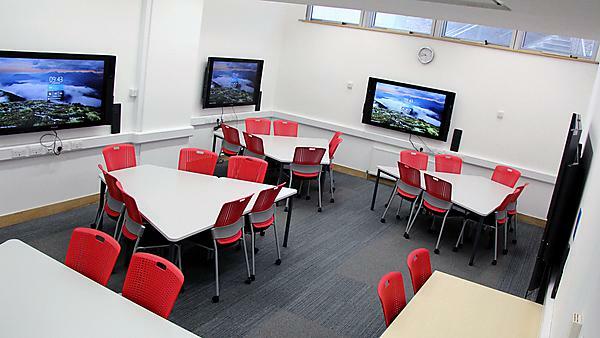 These spaces provide an opportunity for teaching staff to discover, use and feedback on the possibilities of using these new spaces for flexible, collaborative and group work scenarios with students. The Academic Support, Technology & Innovation (ASTI) team are able to run showcase sessions for members of staff who are interested in learning more. The session will give you with an understanding of the technology and its practical application whilst providing hands-on experience with Microsoft Surface Hubs as a teaching and learning tool. If you're interested in organising a session, please contact Academic Support, Technology & Innovation. The Whiteboard app allows quick and easy content creation - you can even save to your OneDrive for Business. With a simple lift-pen-to-start features, you can get writing straight away, using different pen colours, ruler tools, ink to table and more. Watch the video to see how the Whiteboard app works. Easily present PowerPoint presentations using Office 365. Tap and swipe the touch screen to present your slides. Use the pen to annotate your presentation and save the annotations to your OneDrive for Business.